We’d love your help. Let us know what’s wrong with this preview of Burning by Danielle Rollins. To ask other readers questions about Burning, please sign up. i found this book in the new romance section at Barnes and Nobles , however it doesn't seem like it is a romance at all, so was it misplaces? Sarah Lee Yes, definitely not a romance. As much as it pains me to say this because I really love The Merciless, but I just can't with this. I've stuck it out for 139 pages. It's just not pulling me in the way I need a book to right now. I might try again later only to find out what happens in the end. I could already tell it wouldn't be more than 2.5 for me anyway. At least for now...DNF. Gave up 212 pages in. Props for having a majority-WOC cast, but I was surprised to see no mention or discussion about how children of color end up in facilities like Brunesfield inordinately more often versus white children. I gave up because the novel is too obvious in its attempts at horror. For instance, Jessica's eyes turn fully black when she's struggling with her power to start fires with her mind. We all know about the black-eyed children and the mental visual is creepy, but I would find i Gave up 212 pages in. Props for having a majority-WOC cast, but I was surprised to see no mention or discussion about how children of color end up in facilities like Brunesfield inordinately more often versus white children. I gave up because the novel is too obvious in its attempts at horror. For instance, Jessica's eyes turn fully black when she's struggling with her power to start fires with her mind. We all know about the black-eyed children and the mental visual is creepy, but I would find it scarier if her eyes didn't change at all. Then the characters have no way to know whether Jessica is in control of her powers at any given moment, which creates more tension and requires the characters to get to know her better in order to understand her little tells. I’ve never seen Orange is the New Black so that aspect of the description comparison didn’t draw me in but the summary and promise of a creepy 10 year old did. Overall I thought this book was mostly entertaining but I did feel it wasn’t nearly as creepy as I expected and there really wasn’t a definitive conclusion. I really enjoyed the start of this book- I felt the writing was strong and I loved getting to know the main cast of characters. Each felt like they had a great amount of depth and backstory. I found Angela a great main character and I enjoyed reading the story from her point of view. I liked that she was a well rounded character. The setting was unique since the majority of the book took place in a juvenile detention center. I felt that the author did an excellent job transporting the reader to the cold and depressing halls of Brunesfield. Once I started getting a grasp (about 100 pages in) of where the story was headed I have to admit I was a tad disappointed. I sort of wanted more from it? I’m not sure what I expected but the way things played out wasn’t what I was necesarly hoping for. All in all though I think, if there is a sequel, things played out fairly well. Honestly though I’m not sure I’ll be rushing out to read a sequel just because I can tell the tone of the story would change drastically. There was an unexpected romance in Burning that I wasn’t expecting. I actually liked these two together though I feel like their attraction was rushed. I’d have preferred for it to be more detailed and grow slower. I think the romance seems to imitate the book in how it progressed by it starting out wonderfully and the slow building up were great. But somewhere around 3/4ths in things started to feel rushed and it felt to me less care was given to building depth. I really enjoyed the care the author took with the secondary characters. I was really taken with Issie, Cara, and Jessica. I found myself worrying about their outcomes so I feel that was very successful. My expectations of the type of book Burning would be didn’t match completely with how this book ended up being. I found it to be far less creepy than I expected and the ending left something to be desired. I felt that some questions weren’t addressed and things didn’t feel nearly as tightly woven as they had in the beginning. Burning by Danielle Rollins, author of the dark YA horror series called The Merciless, is being compared to the likes of Walter Dean Myers' Monster, Orange is the New Black, Stephen King's Firestarter and Carrie. Sounds like pretty high praise if you ask me. As a fan of Stephen King and someone who thinks there is nowhere near enough horror in YA today, I was very interested to see where this story would go. By the synopsis and prologue, Burning sounds like the chilling gritty story of a juvenile delinquent center, but with a supernatural twist. Is our main character a teenage girl with a dangerous power? Is the Brunesfield Correctional Facility really harboring girls with supernatural abilities? Are there really monsters wandering the woods bordering the building? The answer to all those questions is a big fat no. Instead, we get a rather predictable story about an ordinary girl named Angela who is doing time in a completely ordinary correctional center. There are rumors of monsters in the woods, but it’s obviously just talk. When a young girl named Jessica is brought to the facility and is labeled as being very dangerous, the inmates begin to wonder what she did to be admitted. Shortly after, a program called SciGirls starts taking over Brunsfield. When the president of the program asks Angela to keep an eye on Jessica, Angela finds out Jessica has the ability to start fires with her mind. But is she really as dangerous as the SciGirls program is making her out to be? What is really at the heart of this story is Angela taking strides to do the right thing and help Jessica, even if it means never leaving juvie again. While this could have been a touching aspect of the story, it just didn’t make me care much about what was going to happen. The relationship between Angela and Jessica never got to the point of feeling as sisterly as the author was aiming for. Overall, I wanted to care but it didn’t stir up any of the feelings I have for my own siblings. Anyway, I wouldn’t classify this as a horror story. It’s a supernatural thriller. I like supernatural thrillers, but since I was expecting a horror story, it left me in a ‘meh’ state. Also, I didn’t know this was the first book in a series until I finished it. Will I read the next book? Blah, I don’t know. We’ll see. Still, it’s a fast read and entertaining enough. Buy it if you want, but it isn’t a must. A perfectly creepy thriller. The characters are incredibly well drawn, and the claustrophobic prison-style setting is just right for a story that mixes realism (view spoiler)[and the paranormal (hide spoiler)]. The slowly building danger and tension pairs beautifully with the reader's growing affection for the characters. A great choice for a book you won't want to put down. I'd love this to be the first in a series, but even if it isn't, it's still a satisfying read. Also! It's great to read a b A perfectly creepy thriller. The characters are incredibly well drawn, and the claustrophobic prison-style setting is just right for a story that mixes realism (view spoiler)[and the paranormal (hide spoiler)]. The slowly building danger and tension pairs beautifully with the reader's growing affection for the characters. A great choice for a book you won't want to put down. I'd love this to be the first in a series, but even if it isn't, it's still a satisfying read. Also! It's great to read a book featuring such a diverse cast of characters. Almost none of them felt like stereotypes, and all of them were interesting enough to carry an entire book on their own. The quiet, day to day moments of the story were just as interesting as the more creepy, tension filled parts, and I think this is because the characters felt so realistic. To sum up: you should read this. It's really good. This book was not what I expected. I expected something dark and ominous but that was just not the case. On Netgalley it did say Orange is the New Black meets Carrie. I got the whole Orange Is the New Black vibe but the Carrie part is what confuses me. I didn't find this book creepy at all. Sure Jessica can start fires with her mind, which is cool and yeah maybe in some cases deadly but not scary. With that Said this was a page turner and kept me wanting more. The characters were likable and none of them felt like stereotypes. We also get a little romance which I wasn't expecting at all. All in all a satisfying read. Straight after finishing this book, I couldn’t help but smile. I loved how original and different the story had been and was sure that it had made a lasting impression… but it’s a couple of days later and I’m rethinking that train of thought. While this book was undeniably unique, enjoyable and downright clever at times, it was also a little slow and lacking that intangible quality that makes books truly shine. I don’t know what it is, but it wasn’t there and the more I think about it, the less I can truly say that this book was a standout. Subtle diversity - which is my favourite thing of ever, if you didn’t know. Angela, our protagonist, is dyslexic so for someone who has dyslexia running in their family (aka me), it was refreshing to see that incorporated into a YA novel. I don’t think I have read a story with dyslexic characters before (apart from Percy Jackson, but that hardly seems to count). The female friendships. It is always an amazing addition to a book when female friendships can be included and done well. For some reason, YA contemporaries often portray female friendships as toxic or unhealthy, but the bond between Angela and her cellmates made me smile. It was done with such sincerity, and it really added an extra layer to the story. The suspense! This book is pitched as a horror story and why it isn’t exactly scary, it still had this deliciously creepy vibe. It was suspenseful as hell, and I loved the way the plot just gently crept up on us. The pacing was just perfect too. However, my favourite aspect of this novel was - without a doubt - the setting. Juvenile detention! Ever since I read The Sacred Lies of Minnow Bly earlier this year, I’ve been eager to read something similar and this definitely gave me the same vibes. I don’t know what it is about juvie - maybe the isolation? - but it’s the perfect environment for fascinating character-driven stories IMO, and this definitely delivered on that front. My first complaint is a biggie: there were no explanations! We have no answers to well, anything, and that is quite annoying to put it lightly. We spent a fair amount of time building up to this dramatic and undeniably well-done climax… but then, the book just with literally no answers. I am not okay with that! I need answers. I wanted to know more about Jessica, more about SciGirls and more about everything in general. I won’t say too much because I want to keep it vague, but there were certain aspects of this story that deserved some further exploration. I’m also a little (read: a lot) pissed at the opening ending. I know that I usually say that I’m one of the few readers who are okay with open endings, but this time it just didn’t work. I know there’s a companion/sequel coming out next year but the whole book led to this big ending and then the book just finished. It wasn’t enough to satisfy me. I needed more answers and a more fulfilling conclusion. Like a lot of other reviewers, I did find Angela a little bit dull. I don’t know what it was about her, but the secondary characters were so well done that she paled in comparison. Her “badassery” was also played up a little bit. I just wish we had gotten to see more of her… which makes no sense because she’s our protagonist! But somehow she just felt absent from the story. I also didn’t understand how easily she accepted certain reveals throughout the story. These are the sort of major reveals that would have made you question everything you thought you ever knew but she just accepted it without much fuss. It didn’t feel realistic. I did really enjoy this book, but I didn’t think that the protagonist was a little bit lackluster and the open ending kind of dragged the story down. The setting and plotline - for the most part - was engaging. I adored the characters and definitely got creepy vibes from the writing. I’ll be picking up the sequel/companion as soon as it comes out next year to hopefully get the answers I need, and I look forward to more of the author’s work. A solid novel, but not a standout. An urban fantasy thriller that reminded me of Girl, Interrupted meets Alexandra Bracken's Darkest Minds! Very different and interesting! I really liked the first half, but after that it started to get all "trying too hard". I wish the story was toned down because the characters were very strong and carried the story without all these weird twists. Just before Angela's scheduled release from juvie, THINGS start happening. First, a 10-year-old girl (Jessica) is brought in under high security. Then, a new program called Sci-Girls is causing a major stir among the inmates. There's something about Jessica, Sci-Girls, and the director o I really liked the first half, but after that it started to get all "trying too hard". I wish the story was toned down because the characters were very strong and carried the story without all these weird twists. Just before Angela's scheduled release from juvie, THINGS start happening. First, a 10-year-old girl (Jessica) is brought in under high security. Then, a new program called Sci-Girls is causing a major stir among the inmates. There's something about Jessica, Sci-Girls, and the director of Sci-Girls (Dr. Gruen) that freaks Angela out. Weird things begin happening, and soon it becomes clear that there's evil in this prison that has nothing to do with the girls who are serving sentences. You know how you read those books where you're just EXPECTING the twist at the end to be incredible? You're expecting it to be something you would never see coming and could never come up with yourself. Maybe even something you've never read about before. THAT'S what I wanted from this book... but it didn't happen. It's sort of the same thing that I had going on with the Mara Dyer series. It's all built up with this creepy-vibe, but the ending didn't live up. The First Half: LOVED!! The characters, the writing, the atmosphere.... it all sucked me in. I felt bad for little Jessica. How does a little 10-year-old girl wind-up in max-security?? I also was really intrigued by Angela and her 2 bunkmates' backstories. I wanted to know why they were there and when they would get out. When it became clear where the story was actually headed: UGH. Part of me liked the creepy/paranormal element, but part of me just felt blah about it. It definitely wasn't the thing that kept me reading. I stayed reading because I CARED about Issie, Angela, Cara, and Jessica. I cared abut their families and what happened to them. The Villain and The Ending: I thought the ending was shaky. I mean, parts were explained and explained, and parts were left so muddled and confusing. It left off so that it's probably going to be a sequel. Maybe things will be better explained in that book. I'm not hopeful. Also, I thought the villain was a tad TOO villainous. It was too dramatic and I just didn't think that drama was necessary when the setting and characters were so strong. There is a romantic element to this book, and all I have to say about that is PUKE!!! It felt like Orange Is the New Black (the TV show) and The Walls Around Us had a baby, and that baby turned out not to be able to live up to his/her parent's spotlight. Sort of like when 2 celebs have kids and none of them have that "it" factor. OVERALL: It was OKAY. The problem with that is-- okay isn't really good enough for me. I want more than okay, I want AMAZING. It's creepy, it has strong characters, but the over-the-top villain and the ending weren't for me. I.....wow. I have a lot rolling around in my head. If you are looking for something different, here is your book! I am just sorry to see a rushed ending and skimmed over world building. I can see some potential for future books in this one. **U.S. readers, don't forget to enter the giveaway at the end of this review! The nitty-gritty: A suspenseful young adult tale with awesome female friendships and an intriguing supernatural element. A couple of years ago I read and loved the dark and violent Merciless, written under Rollins’ pen name Danielle Vega. And so when the author offered me a copy of her latest, I was looking forward to more of the same. But as much as I enjoyed Burning, it turned out to be much tamer than I was expecting, and while that’s not a bad thing, it did throw me for a bit until I realized this story stands well on its own, with its own charms and strengths. That’s one reason, I suppose, why authors decide to use pen names in the first place, to distance their “name” from a particular book or writing style, so that they can strike off in another direction without fear of being labeled. Burning is mostly a thoughtful drama about minors who have been incarcerated and how they deal with and survive prison life, but there are also some thrilling supernatural moments as well, although for me, these were not the main focus of the story. Angela is doing time in the Brunesfield Correctional Facility for theft. She’s been trying to keep a low profile by following the rules, and she’s only months away from being released. Waiting at home for her is her little brother Charlie, who continues to write her letters. Angela longs for the day she can go home. But two new arrivals at Brunesfield shake up the inmates’ day to day life, and suddenly Angela isn’t so sure she’ll be released any time soon. First, a young girl named Jessica arrives but is immediately put in segregation due to her “dangerous” nature. Shortly after, a scientist named Dr. Gruen visits the girls, explaining that she’s starting a group called SciGirls which will help them prepare for jobs outside the system. These two events are related, but it isn’t until strange things start happening that Angela starts putting the pieces together. It turns out Jessica is in Seg Block for a good reason—she can set things on fire with her mind. After Dr. Gruen asks Angela to befriend Jessica, she suspects that Dr. Gruen might be up to something. The mystery of Jessica and her strange ability slowly builds as Angela gets to know the frightened girl, and Dr. Gruen starts convincing all the girls at the facility to join SciGirls. Because I’m a fan of everything speculative fiction, it surprised me how much I enjoyed the relationships part of the story over the horror parts. And while I liked the idea of a little girl who has a genetic condition that gives her the power to start fires (and yes, I had flashbacks to Firestarter! ), the scenes involving Jessica trying to control those powers weren’t my favorite. I was much more interested in the friendships between Angela and her roommates Issie and Cara, and the tension between the guards and the inmates. You know, the real life stuff! Angela is dyslexic, and has a hard time reading, and so when she gets letters from Charlie, Issie reads them to her. It was so nice reading about a friendship between teen girls who actually help each other out. Of course, there are plenty of mean girls at Brunesfield, and some of the scenes are somewhat violent (but in more of a PG sort of way), but I like that Rollins gave many of her main characters the ability to empathize. The other thing that Rollins does really well is to create a wonderful sense of tension. There are several mysteries going on in this story. There’s the mystery of Jessica and her origins, and exactly how her strange abilities work. Then there’s the diabolical Dr. Gruen, a smooth talking woman who is able to convince many of the girls at Brunesfield to join up with the suspect SciGirls organization. She reminded me of a cult leader whose evil nature hides behind charm and charisma. We don’t find out until nearly the end what’s up with SciGirls, so the reader is kept guessing for quite a while. The last quarter of the book is high on action and that’s when Rollins pulls out all the stops. She definitely knows how to write a page-turner! My only complaint with Burning would be that at times it just felt a little too sweet and nice, especially considering the prison setting. I have to admit it was hard not to compare it to Fellside at times, a very different prison story, even though the main idea is basically the same (a female character winds up in prison for the wrong reasons and encounters a supernatural presence.) Yes, there were some violent moments in Burning, but I never really felt shock while reading them. (Compared to Fellside, where I cringed the entire time I was reading the book). Obviously it’s not fair to compare the two, because one is clearly aimed at the YA market, but a touch more grittiness would have been fine with me. But Danielle—both Vega and Rollins—knows how to craft a well-written story. For YA readers who like a mix of drama, action, a smattering of romance and a touch of the supernatural, Burning has something for everyone. Big thanks to the author for supplying a review copy. Danielle was generous enough to provide a signed, finished hardcover for one U.S. winner! I'll be randomly selecting a name on July 1, good luck! The buzz surrounding Burning suggests it’s a cross between Orange is the New Black: Juvie Style and Firestarter, and there are elements of both of these to be sure, what with the girl who is connected to fire-related events, and all the inmate stories. - For starters, the blurb begins with the line “After three years in juvie, Angela Davis is now months away from release” while the Angela of the book has been in juvie for just eighteen months. - Angela was super gullible/ignorant and had to see things many many times and then have them spelled out for her by another character before she “worked out” what was going on. While the reader was able to figure it out by the second mention, if not the first. - In terms of pacing, though Jessica arrived at the facility on page eleven, and though some events happened in between that hinted at a little something creepy, nothing really began to escalate until almost two thirds of the way through the story. - At some point it stopped feeling like a prison story, and started feeling like a story set in a kind’ve strict boarding-school for only-a-little-bit-difficult girls. - It wasn’t scary. Not even a little bit. The girls in this prison had no street smarts, they didn’t look suspiciously at a situation that was too good to be true, and pretty much every single one of them fell easily into a cult-like study group. With the exception of a couple of fights or arguments, there was really nothing here to suggest that many of these girls grew up on the rough side of town or committed terrible crimes to end up here, though it is stated that they did. A eerie, spooky story that would fit right in as an X-Files episode. Rollins, Danielle. Burning. Bloomsbury, 2016. Angela is so close to getting out of juvie, she can almost taste freedom. Just a few more months toeing the line and she'll be out in the world again. Then Jessica arrives. Jessica is ten, the youngest of the inmates, and there are all kinds of wild rumors circulating about what she did to earn her sentence. Angela is tasked with befriending the young girl as a condition of her impend A eerie, spooky story that would fit right in as an X-Files episode. Angela is so close to getting out of juvie, she can almost taste freedom. Just a few more months toeing the line and she'll be out in the world again. Then Jessica arrives. Jessica is ten, the youngest of the inmates, and there are all kinds of wild rumors circulating about what she did to earn her sentence. Angela is tasked with befriending the young girl as a condition of her impending parole, but when she finds Jessica setting fire to her teddy bear in the middle of the night, she realizes she may have bitten off more than she can chew. This book is equal parts spooky and mysterious, with just enough of a paranormal element thrown in to hook even the most reluctant of teen readers. I could easily pair this book with viewings of X-Files or Orange is the New Black. Because I imagined this book as a paranormal television show, it was easy to guess at the ending, but guessing it early did not spoil it for me. 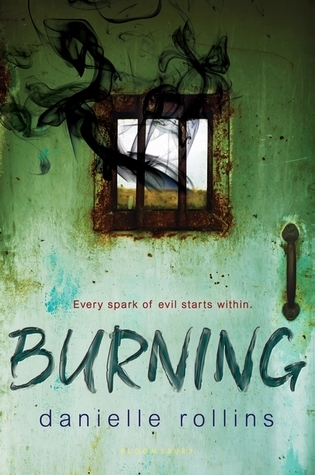 For all the teen readers who want the next scary book, Burning is highly recommended. Note: This review is based on the 44% of the book that I read. This review is very painful for me to write. If you saw THIS post then you know that Burning was a book that I was REALLLLLYYYYY looking forward to. As a huge fan of Orange is the New Black, I was definitely intrigued with the fact that this book was compared to it, and adding a little mystery to that? I was sold. Unfortunately, it didn't work well for me. I think the main problem I had with this book was that I really didn't care about any of the characters. Angela was ok, but there was no connection there. Jessica was interesting enough, but I was expecting some heavy duty creepy on her part and from what I read, it was just ehhh. "Monsters are more interesting than heroes." Another issue was boredom. It felt like everything was dragging on and eventually I was forcing myself to pick up my kindle and read. When it comes to the point of forcing, that's my clue that it's time to DNF. I'm still curious about the mystery behind Jessica and why Angela is in Juvie, but my curiosity wasn't enough to make me finish the book. Burning was a book that I had high hopes for, unfortunately it didn't measure up. I'm pretty sure I did request this - I haven't yet watched Orange is the New Black which this is compared to - but after a few chapters I'm just not feeling this one at all. I usually love dark stories set in psychiatric hospitals, etc. but not connecting with these characters at all. Maybe I'll try the show and then come back and give this a try? I was dead-set against watching Breaking Bad too and then of course I loved it. Read more of my reviews on YA Romantics or follow me on DNFing for now. lots of diversity(mc is African-American and has dyslexia esp) but underwhelming as a thriller. DISCLAIMER: I got this eARC for free from NetGalley. Expected publication: April 5th 2016 by Bloomsbury USA Childrens. It's been a while since I checked out NetGalley. Until one day, I randomly found myself on the site and this was one of the titles on the front page. Hey, it was a new year, new reading goals, so I decided to sign up for it. The blurb says it's like Orange Is The New Black but I don't have Netflix (I have Hulu Plus) so I'm not familiar with it. The setting is pretty interesting to DISCLAIMER: I got this eARC for free from NetGalley. The blurb says it's like Orange Is The New Black but I don't have Netflix (I have Hulu Plus) so I'm not familiar with it. The setting is pretty interesting too. A juvenile correctional facility? Wow, it's not a place where most YA authors would want to set their stories. And the protagonist of the story is incarcerated for something awful. Such a far cry from the goody-two-shoes kind of perfect high school girl. Angela was just living her everyday life, as much as she could in jail, keeping her head down and doing her chores. She has 3 months until her release and all she needed to do was to wait it out. Until another inmate join them, Jessica, 10 years old. Dangerous. Jessica was initially sent to Segregation. Angela finds herself connecting with Jessica and eventually, joins her, Issie, and Cara in one cell. With Jessica comes a new team of people seemingly aiming to help the facility as well as educate the girls. But instead of good... strange things began to happen upon Jessica's arrival. Monsters are more interesting than heroes. LOVE that quote. And there is some truth into it. Some heroes are so bland with no personality that it makes it so easy to react to the villain. I've read some stories where I don't care much for the protagonist while either I absolutely hate the antagonist or at least pay attention to him/her more. Case in point, Harry Potter. Harry, to me, was so boring. I connected more to the most minor characters and the villains. But that wasn't the case here. I liked Angela. I thought she was a strong character with a good head on her shoulders. She made the most out of the crappy situation that she was in. Her romantic moments felt natural and age-appropriate. Almost shy at times. Jessica is just a sweet little thing. It was hard to have ill feelings towards her. Whether she's a hero or a monster, I will let you find that out yourself. Either way, she and her situation are very interesting. Another thing I liked about the author's character building was it didn't play the cliche card. Yes, Angela and her friends were in prison for something wrong they did but really, they weren't bad people. They were actually pretty nice. Scary at times... and of course, once you know what they were in there for but with each other, they're pretty normal girls with crushes and insecurities. The build-up was paced well. It really felt like the reader is living each day alongside Angela. Each "day" felt long and full and because of that, the conclusion felt oddly satisfying. I felt like it ended the way it should, where it should. The final scenes were pretty intense and dramatic. The ending was a nice set up for the next book. Clearly, this is going to be a part of a series. There's an epilogue and it got me so excited for the sequel... only to realize that this book isn't even officially released yet. Oh boy, be on the look out for this one when it does. I loved the way the author set this novel up. I knew there was something sinister about Jessica the minute that she was introduced but I just had to wait as I let the author slowly and meticulously let the novel run its course. Jessica seemed like a typical teen on the outside. It was the way that she was handled by others and how they treated her that made me suspicious. She appeared to be small and fragile amongst the other prisoners in this correctional facility as she was brought in and for I loved the way the author set this novel up. I knew there was something sinister about Jessica the minute that she was introduced but I just had to wait as I let the author slowly and meticulously let the novel run its course. Jessica seemed like a typical teen on the outside. It was the way that she was handled by others and how they treated her that made me suspicious. She appeared to be small and fragile amongst the other prisoners in this correctional facility as she was brought in and for that, I felt that she was hiding a secret that others knew nothing about. A secret, which landed her amongst these offenders that, would soon bring about havoc. Placed inside isolation the minute upon her arrival, the other inmates had no chance to lay their claims on her or the opportunity to speak with her so, when Davis returns from bringing down her food tray with burns on her hands, the rumors begin. How could she suffer burns from delivering a food tray? Davis only has three months left on her sentence and it’s her brother that she misses the most while locked away. These three months and this attachment become obstacles for Davis as the correctional facility is challenged by science. I received a copy of this novel from NetGalley and Bloomsbury USA Children’s Books in exchange for an honest review. Thank you! 4.5 stars! Such a fun and interesting read. I loved the different aspects of mystery, thriller, fantasy, friendships, and a smidgen of romance. Like the back of the book says, it reminds me of Carrie and Orange is the New Black. DNF - I could tell as soon as I started this that it wouldn't be for me. The way it's told bothered me immediately. All tell, no show. Ableist language: dumb, crazy, spaz. I actually ended up liking Burning. It did not seem slow, I thought the plot was okay. I feel like it could have had more detail, but it was not as bad as I thought it would be. The only thing I disliked about this book is that it ended with a cliffhanger. Other than that, it was a book that I had a hard time putting down. Brunesfield Correctional Facility is very secluded, keeping very dangerous girls away from the outside world. After about a year and a half, Angelina Davis is convinced that her release date is soon. Imagining seeing her brother again, imagining freedom, it is her motivation to keep her out of trouble. That is until Jessica, a highly dangerous ten-year-old, arrives. As soon as she arrives, people are getting burnt, fires are found around the building, and multiple rodents are found burnt to death. Angela finds out the culprit is Jessica, but she knows she has to keep her safe. After new secrets are revealed, and the true danger is discovered, Angela tries to escape. Little does she know, escape will not be easy. In the beginning, Jessica is portrayed as shy and quiet. Nobody knows why she is the most dangerous girl in the facility. She spends most of her time huddled in a ball, and she refuses to talk to anybody. When Angela befriends her, there are many different secrets revealed. She burnt a house down, killed her foster dad, and severely hurt her foster brother. She is more fragile than she seems. She tries to control her powers, and she does not want to hurt anyone. She is willing to help keep the other girls safe, even if it means getting hurt herself. In the end, you learn that she is willing to sacrifice her life to keep the girls safe from the real danger. This review has been hidden because it contains spoilers. To view it, click here. This book was very good and suspenseful but at the end I felt like the end was incomplete. I felt this way about the ending of Burning because at the end Jessica was just taken and you never find out what happened to her which I found very annoying. Burning was a little weird to be honest and it’s ending was a little disappointing. I thought Jessica and Angela would have finally gotten they’re revenge. This book has a lot of cliffhangers and adrenaline rushing scenes and I recommend it to anyone who likes horror. Also writes under pseudonyms Danielle Vega and Ellie Rollins.